Join us for a cruise around lake Winnipesaukee with a stop at Castle in the clouds on Saturday June 1st. 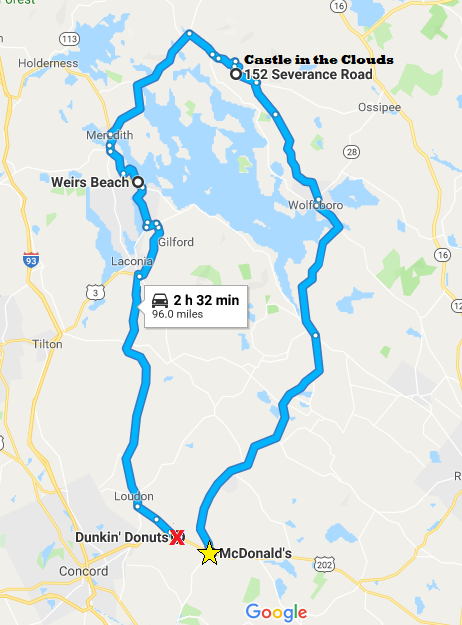 Starting out at the McDonald's in Epsom (1881 Dover Rd, Epsom, NH 03234) at 9:30am and travel back roads up through Alton, Wolfeboro, and stop at Castle in the clouds in Moultonborough. We will be stopping at Castle In The Clouds for a breif walk around the grounds entering through the main parking entrance (free). From there we will continue our drive around the lake stopping for lunch (location tbd by how many people we have. suggestions wanted) and anything else people might be interested in. finnaly ending back at the rt202 Dunkin Donuts.